Samsung got off to a rocky start when they released their first tablets in late 2010 and early 2011, but only now are we finding out just how poorly Samsung did in those first few quarters. A new internal Samsung doc has been uncovered, and it tells us that Samsung's own internal figures place their tablet sales at a much smaller figure than anyone had previously expected. The doc was found during discovery by Apple's lawyers as part of the latest round of patent infringement lawsuits between the two electronics giants. According to the chart posted by Forbes, Samsung believes they sold around one million tablets in the US in 2011. This was during the period that Samsung was caught out with the lie that they had sold 2 million tablets in the first quarter of 2011, but later had to walk that claim back and admit that they had made 2 million tablets but had not actually sold them all. Now we know that Samsung had sold only about half that many. That's a million tablets for the entire calendar year, not just a single quarter. In comparison, Samsung believes that B&N sold 1.5 million NookColors in 2011. 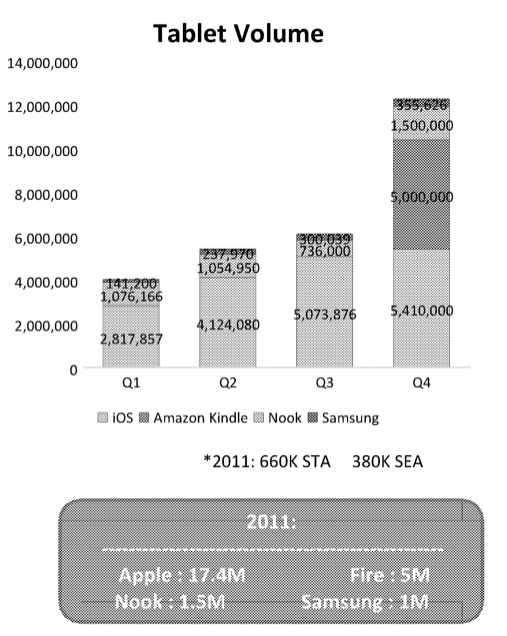 This same chart says Amazon sold 5 million Kindle Fire tablets after it was released late in the year, but even though both Samsung and B&N were outdone by Amazon that doesn't change the fact that Samsung was still thrashed by a bookseller which at that point had only released a a couple ebook readers and a couple tablets (counting the Nook Touch in mid-2011 and the Nook Tablet in late 2011). Those were Barnes & Noble's glory days; it's a shame they didn't last. Geeze. Talk about burying the lede, Nate. Fact is, Samsung lied about its sales to its own investors, and inflated its share of the tablet market by 100%. Not worth noting what this did to BN’s chances? I don’t think it did much to harm B&N, not compared to the immolation which was self-inflected. Also, the fact that Samsung lied is not news; that was uncovered back in 2011. But it was worth mentioning so I edited the post. Good on you. You’re right. It’s news. Cus’ now we know how big a freaking lie Samsung told. Yes, it was a massive lie. The scale is shocking in retrospect.